New York snakes mean different things to different New Yorkers. Apart from the snakes at local zoos and in private hands, there are no snakes in New York city any longer. There are no native snake species living in the wild in Central Park. 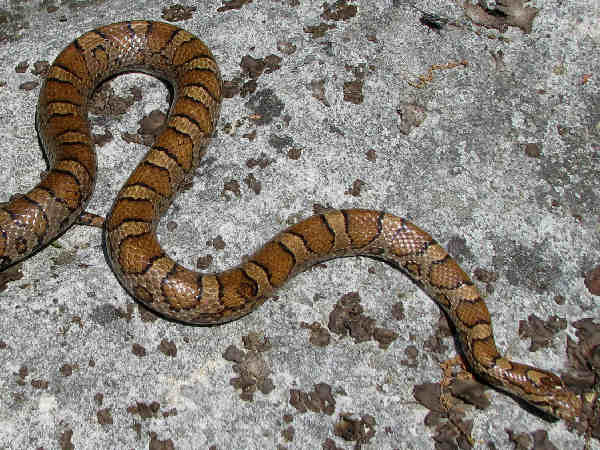 Many city dwellers get startled when they hear of escaped snakes running through their streets. New York residents outside New York City limits encounter up to seventeen different snake species, depending on how far they roam their state. 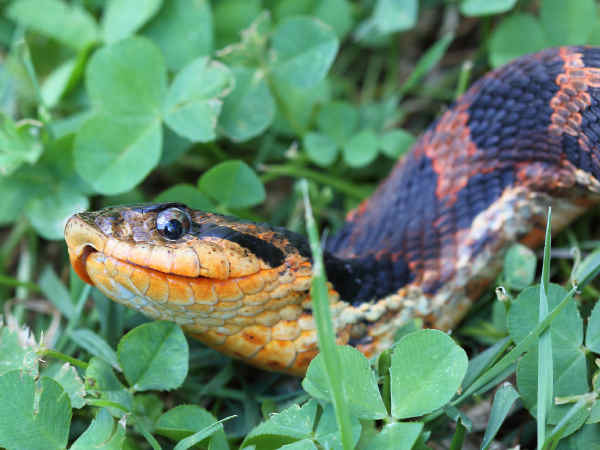 The state’s three venomous snakes, a Copperhead snake and two rattlesnakes, the Timber Rattlesnake and the Eastern Massasauas often get top billing. The picture shows a Copperhead snake. It’s range in New York is limited to the Southeast corner of the state up to the Catskills. A quick look at the map means hardly anyone in the state need worry about it. 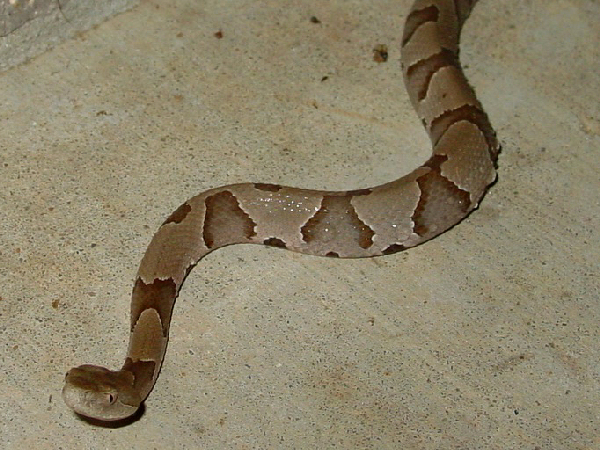 Copperheads grow up to three feet in length and their light body is covered with darker crossbands. The head shows a characteristic copper color. The Timber Rattlesnake is probably the most common species in the United States. It is listed as threatened in New York and found on hillsides mostly in the south and extreme eastern borders of the state. Again in the south is reaches up to the Catskills. 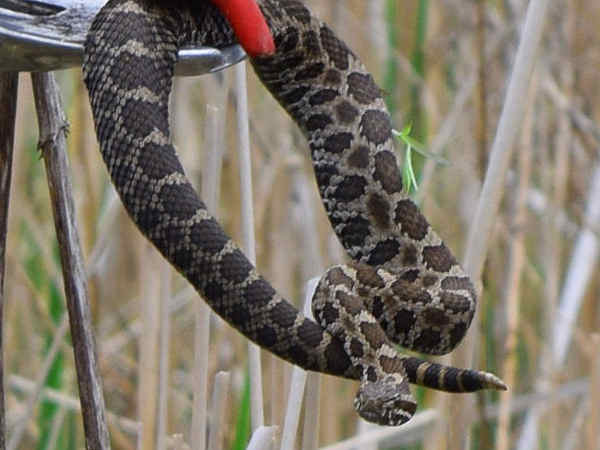 The picture shows an Eastern Massasauga (Sistrurus catenatus). 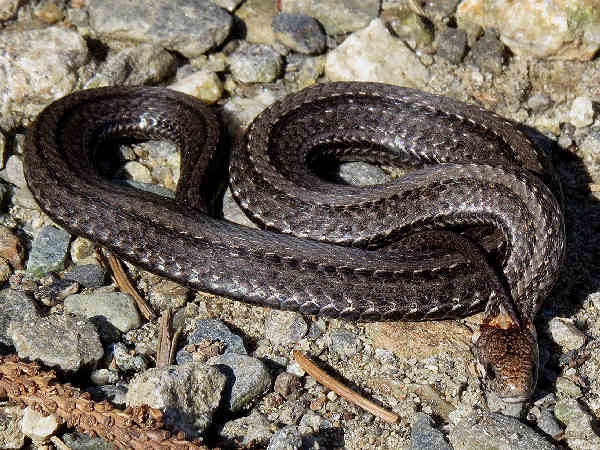 It’s a relatively small snake and listed as endangered in New York. There are two small populations near Syracuse and Rochester. 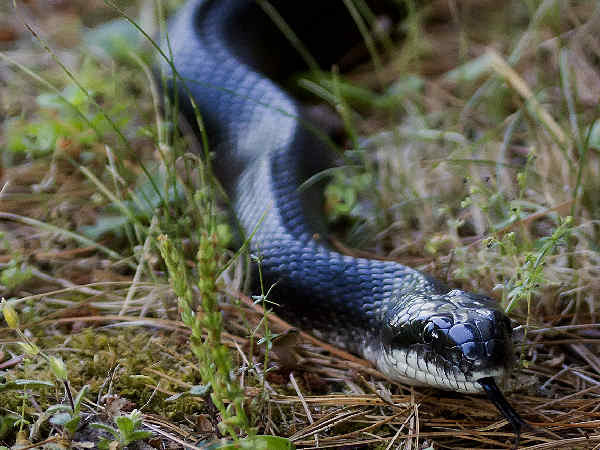 The snakes best known as Black racers inhabit most areas of Long Island and areas a bit north of New York City. They are long, thin snakes with a black body, and as the picture highlights, white chins. Many of the New York snakes can be found in the water. The formal name watersnake applies to species in the genus Nerodia. The Northern Watersnake (Nerodia sipedon) is probably the species with the widest range, including New York. Their body color tends to change depending on age and location, so often it’s not the best field identification clue. Knowing that it’s the only species in the state is the best clue. They tend to be large and bulky, so it’s difficult to misidentify them with the smaller swimming snakes such as garter snakes. 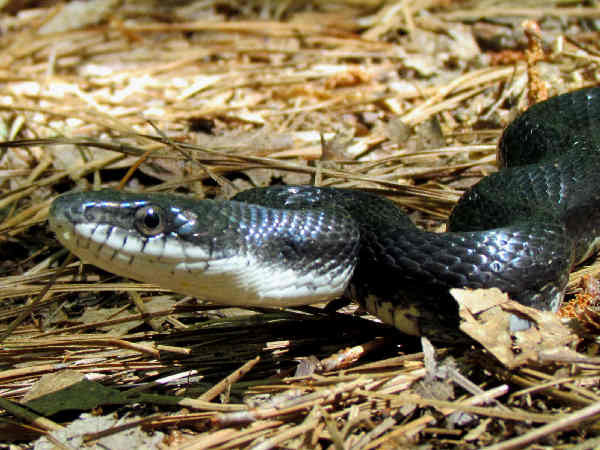 Meet the largest of New York snakes, the Black Rat Snake. They grow up to six feet in length and are a fairly common species in New York’s woods and agriculture areas. 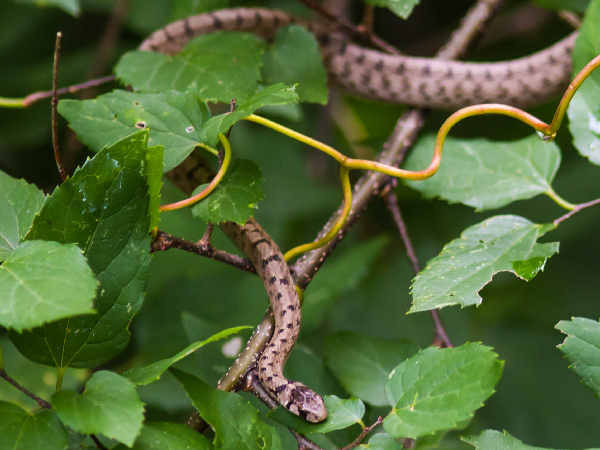 Residents can often see them near barns, because of the local rodent populations, the Rat Snake’s preferred diet. There are no Black Rat Snakes on Long Island, so there’s no misidentifying them with the Black Racers. One final thought on them. First and foremost, these large snakes are as afraid of people as people are afraid of them. In residential areas, they are basically only passing through. There is never a sufficient amount of rodents or other food sources for them. Therefore there is often little need to panic when one enters the neighborhood. 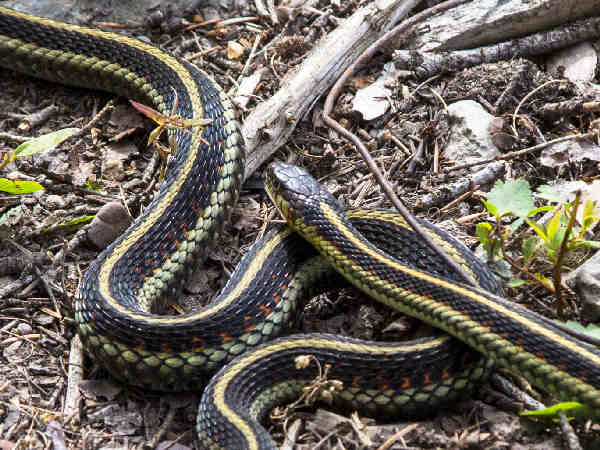 Most New Yorkers are familiar with Garter Snakes. The states three species are common in residential areas, none so common as the Common Garter Snake (Thamnophis sirtalis). 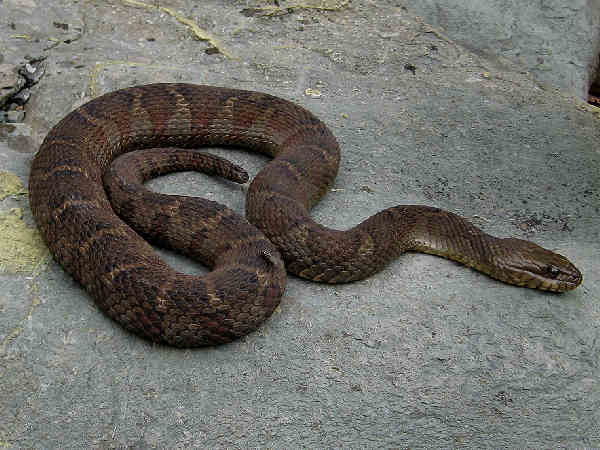 In fact they are the most common of all New York snakes, everywhere throughout the state. Eastern Ribbon Snakes (Thamnophis sauritus) might not be the most familiar of snakes because it does not contain the common name Garter. These are snakes in the same genera that tend to be a bit thinner than traditional Garter Snakes. Finding a patch of yellow or white in front of the eyes is a very good field identification clue. They range across the state. However, their populations are limited in most areas. According to the Department of Environmental Conservation, a small population of the species was discovered along the southwest border with Pennsylvania. The Ring-necked Snake (Diadophis punctatus) in the second picture is another of the common New York snakes. It’s also the only member of the genus. The dual color body, dark on the top and a bright shade of orange or yellow on the bottom serve as the best field identification clues. 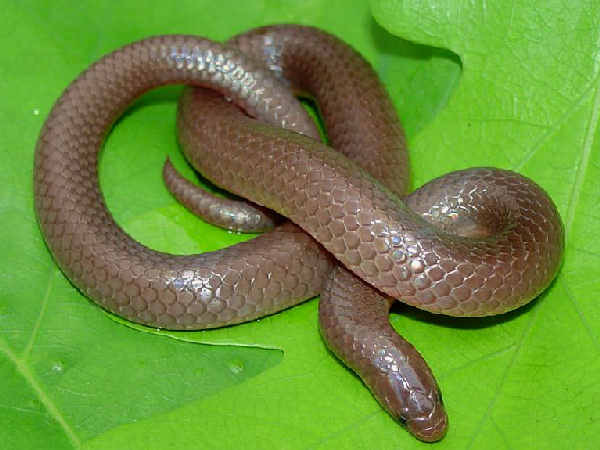 The picture highlights the snake’s characteristic ring neck mark. 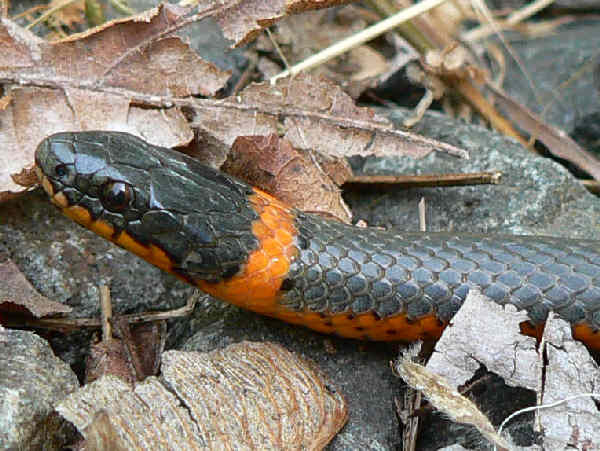 While ring-neck snake bites are rare, touching them is not recommended. They can secrete a foul smelling chemical. New York host two of the three very common Storeria species, the Red bellied Snake (Storeria occipitomaculata)and Dekay’s Brownsnake (Storeria dekayi). Both species are small and relatively inconspicuous snakes that are also reasonably habitat adaptable. Both species also have a presence in all areas of the state. Eastern Wormsnake (Carphophis amoenus) is a very small and thin snake that inhabits forested areas in most parts of the Eastern United States. Small populations have been found on Long Island and a bit north of New York City. A few records of Queen Snakes (Regina septemvittata) have been recorded in the southwest part of the state. Smooth Greensnakes (Opheodrys vernalis) are a much more common species.